Drone survey offers its unique capability in surveying field especially in the mountainous area where it is difficult and dangerous to access. With our proper procedure and experience, we could produce the data that could rival the data using land surveying technique. Furthermore, the point cloud generated in drone survey is much higher and denser, which can give a more accurate landform representation. On the first of February 2018, the “Jebel Jais Flight: The World’s Longest Zipline” was announced by Ras Al Khaimah Tourism Development Authority. Falcon Eye Drones (FEDS), is proud to be a part of this project back in early 2017. 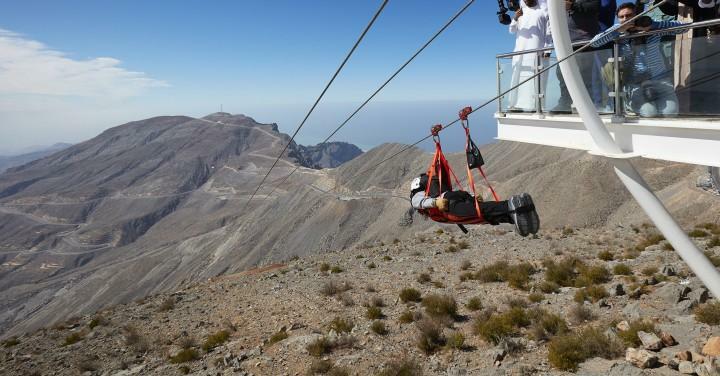 The world longest zip line, measuring at 2.83 km, is located at the mountainous region of Jebel Jais. Home to the tallest mountain in the UAE, the peak is 1,934 m with an abundance of hiking and mountain biking trails. When the project was initially proposed, there was a huge question of how can the surveyor acquire topography data of the area. The zip line corridor span from the highest point of approximately 1,600 m to the lower point of 850 m. The deepest of the gully is around 750 m, making the ground surveying methodology nearly impossible. With the emergence of UAV and SfM photogrammetry, drone survey becomes the ideal way to obtain the geographical data especially the inaccessible part of the mountain. Usually, in a mountainous area, the multirotor drone is more suitable to operate, as they carry less risk for take-off and landing. With the corridor length of 3 km, multirotor could do two passes (total of 6 km flight distance) along the corridor, which is not enough to cover the corridor with the required ground sampling distance (GSD). To do a proper corridor survey, with a more consistent GSD is required. That’s why we choose a fixed-wing drone for this mission, where it can quickly cover more than 60 km total distance in a single flight. The most challenging part for this mission is the flight planning. Usually, during a drone survey mission, flight plan could be generated automatically by mission planning software, and it’s planned according to ground elevation data so that the aerial images have a more consistent GSD. With the elevation difference of 1,000m, the flight planning software could not generate a proper flight plan. When using the usual corridor survey planning, it is impossible for the drone to climb or descend to reach a consistent GSD. One of the most challenging situations is when there is a change in the corridor. All the mission characteristics including waypoints, distance in between flight lines, and altitude are all calculated manually. If there are any changes in the mission design, it might take a day to modify the flight plan. We use the “zig-zag” approach to allow the drone to reach its designated altitude. The total flight distance is more than 35 km, and It takes more than 10 passes to cover the whole corridor. The “zig-zag” approach allows us to maintain the GSD in between 3.5 – 7.5 cm. Safety is always our priority in our mission. Our chosen take-off and landing site is on the road under construction. The size of the landing strip measuring at a length of around 130 m and width of 12 m. One side of the road is a mountain wall, while another side of the road is a cliff; making the cliff side as the opening for a go-around. Landing proof to be a challenge for us, it took three go-arounds and a change in approaching direction for us to land the UAV successfully. To increase the safety measure of the mission, we deployed 2 additional assistants to monitor the traffic along the road, especially when the UAV is approaching the strip, so that the external pilot could focus on the UAV, and the internal pilot could focus on the ground control station. Operating at the elevation of 1,600 m, the UAV is flying below our ground station for most of the time! Most of the UAVs are equipped with commercial grade GNSS receiver, accurate at a few meters. It is essential to add the ground control points to tie all the aerial images to accurate ground points. Ground targets were carefully placed and distributed at the accessible locations along the corridor, particularly at the beginning point and the end point of the zip line. All the ground targets are measured using RTK GNSS equipment better than 3 cm precision. In a photogrammetric project, we use checkpoints to evaluate the accuracy of the data. Checkpoints are the ground control points that are not used during automatic aerial triangulation (AAT) and bundle block adjustment (BBA). Usually, for any photogrammetric project, the accuracy in Z is around 1-3 GSD. Surprisingly, all the checkpoints in this project are accurate within 1 GSD! Moderate temperature: Camera is relatively stable when there is no big temperature difference. Light wind: The attitude of UAV is stable throughout the flight, most of the aerial images are in near nadir. Camera settings: Sun condition changes throughout the flight, camera settings are changed to produce a well-exposed image.